Colors to pair a matte purple shadow with! A good matte dusty-purple is hard to find. Purple is one of those colors that I find to be more flattering in a matte or satin finish. Sparkly or metallic purple can look a bit too garish for work and school, but a dusty lavender grey is a much better option. 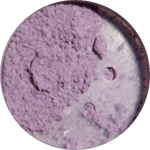 My favorites are Everyday Minerals Matte Eye Shadow in Tide Pool (limited edition, unfortunately), and Urban Decay Matte Eyeshadow in Cult (slightly deeper purple). This is a quick run down of some foolproof shades to pair matte purple with. Champagne and Purple: The contrast of a pale glimmering gold with a smoky purple is gorgeous. Swatches: MAC Retrospeck (left) and Tide Pool (right). Chocolate and Berries: Nothing goes with purple as well as a rich cocoa when you want a more sophisticated look. Swatch: MAC Cement (left), and Tide Pool (right). Bronze on Purple: For instant drama, an ambery, metallic bronze shadow or glitter paired with a matte purple can really play up your eyes. Swatches: NYX Pearl Mania in Oro Pearl (left) and Tide Pool (right).